Roy Hargrove is continually one of my most favourite jazz artists. 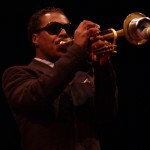 Among the original ranks of those titled the “Young Lions of Jazz” in the late 80′s and early 90′s, Roy Hargrove has, from his late teens, had high expectations cast upon him. (Just as reference, other original ‘Young Lions’ include Stephen Scott, Marcus Roberts, Delfeayo Marsalis, Joey DeFrancesco and Joshua Redman to name a few). Hargrove has not dissapointed since finishing his musical studies at Berklee and New York’s The New School. In the last 20 years he has come out with 17 albums which either bare his name or he was the band leader. Looking up his Wikipedia page, I notice he turns 40 this year. And he is still considered not yet at his prime. Ahh the refreshing expectations of refined excellence from the Jazz world. 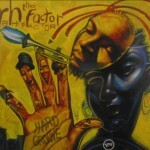 I first got acquainted with Roy Hargrove in the late 90′s with some live performance recordings, but he came onto my map in a very big way after his alternative band The RH Factor‘s first release ‘Hard Groove’ in 2003, and then subsequent releases ‘Strength’ (2004) and ‘Distractions’ (2006). Since that time, I’ve been following all of Roy’s releases with great interest. I had the pleasure of watching Roy perform alongside Herbie Hancock and Michael Brecker in Hong Kong in 2003 for Hancock’s ‘Directions in Music‘ album tour. Then I saw Roy again in 2007 at the Toronto International Jazz Festival for his ‘Nothing Serious‘ album. Needless to say I came upon Hargrove’s 2008 album ‘Earfood’ with great anticipation. The album was hit-and-miss for me. 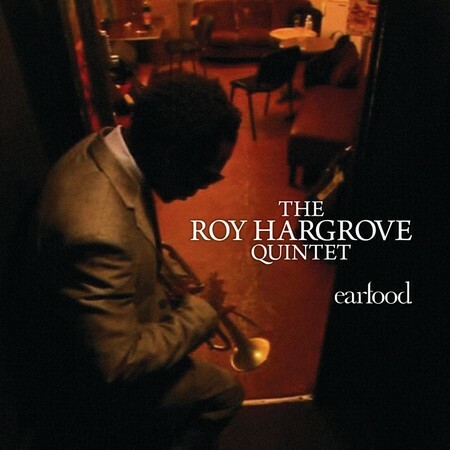 Maybe because I’ve become so familiar with Roy Hargrove’s sound and style, that half of the songs on this album slipped through my eardrums without registering much of any kind of impression. The first two songs on ‘Earfood’ seem like pointless preamble. He takes two whole songs to set the tone of the album, like a maitre d’ taking an unnecessary amount of time settling you into a comfortable chair. Instead, most people who have ever heard a Roy Hargrove song before already know what kind of sound to expect, and so spending two songs re-educating us on something we already know is a waste of time. The songs that I did sit up and take notice to were: Strasbourg/St. Denis, Starmaker, The Stinger, Mr. Clean, Style, and Do Wisdom The Prize. Thats 6 out of 13 songs on the album. Not to say that other songs were unenjoyable, they were. 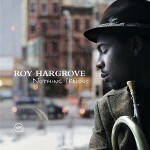 But those other songs are exactly what we’ve come to know and love from Roy Hargrove. Each of the songs are a reenforcement of his brand and persona. The slow, pulsating, intoxicating, smooth sounds of Hargrove’s flugelhorn and the tight assemblage of his band are well appreciated. The problem I have with those other 7 songs is that they don’t offer anything new about Roy. The 6 songs that I did find intriguing were worthy of mention only because Hargrove allowed his group to be more adventurous with the melody and its arrangement. The use of alternative chords and sounds not normally found in Roy Hargrove’s music were refreshing. It also should be noted that I found the musician that stole the show on the album was Justin Robinson on Alto Sax; not Hargrove himself. For those that are not familiar with Roy Hargrove, he is perhaps the most accessible of contemporary Jazz’s authentic pioneers, meaning, his style of jazz can be understood or appreciated by the mainstream/non-jazz listener, while still being true to jazz’s form. 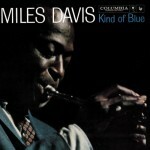 His music, as it is in this album and on all his albums of the last 10 years, is a modern return to Modal Jazz, the style of jazz made famous by Miles Davis and his ‘Kind of Blue‘ album. Highly melodious, with a pulsing syncopation. The result is highly pleasurable music, which I guess supports the aptly-named album title ‘Earfood’. 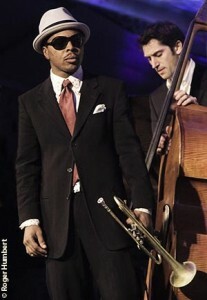 I however, have two bones to pick with my beloved Roy Hargrove, and both pertain to his branding. The first issue of branding comes from Hargrove’s music. While I understand that a musician, in the process of becoming better known and creating a following, should create a ‘brand’ of music he/she is known for, there is something to be said about growth, experimentation, maturity, and also the occasional change in musical direction. 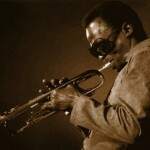 Roy Hargrove is very obviously trying to walk in the footsteps of Miles Davis, but Hargrove has to realize that part of what made Miles Davis such a giant of jazz is not only that he is the highest-selling jazz musician of all time by popularizing modal jazz, but that Miles Davis had the courage, vision, and endurance to shift at 90 degree angles into different musical frontiers (Bebop to Modal to Fusion and back again.) 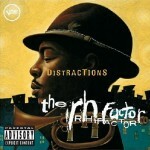 Roy Hargrove has turned heads with the progressive jazz-funk-soul-hiphop sounds of The RH Factor, but the question I come back to listening to ‘Earfood’ is, “Roy, where are you taking us with this?” I’m just hoping that Hargrove’s musical brand can be known as one of evolving and pioneering contemporary modal versus re-playing/maintaining a path of modal jazz we’ve gone through before. The second issue about branding I have with Roy Hargrove deals with the visual aesthetic. Again, very much trying to emulate Miles Davis in all things look & feel, Roy Hargrove is like the visual incarnation of the Miles Davis from the late 50′s and early 60′s. I sometimes feel that Hargrove tries too hard, or spends too much of his attention on his and his band’s look rather than his and his band’s sound. The thing with Jazz history is that it has been littered with numerous memorable personalities. While many had aesthetic trademarks — a special beanie hat, square-rimmed glasses, a pair of sun glasses, etc. — there personalities were first known for the music, and not their eccentric looks. And these musicians didn’t consciously choose to be characterized by a certain look. They were too into their music to bother with thinking about trend-setting style. 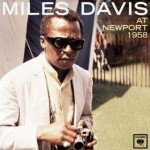 The only jazz musician who really did fuss about his looks was Miles Davis. Roy Hargrove is no Miles Davis yet. The other thing is that Roy Hargrove is trying to play into his style, like the way he dresses and presents himself is a package with his kind of music. As if everyone who listens to him should be the kind of ‘cool cat’ that always loves to wear grey suits and black narrow ties and fedoras. Roy Hargrove is not only trying to brand himself and his music, he is trying to brand an entire genre of jazz. Just stop it Roy. Focus on the music and the rest will work itself out. Well, ‘Earfood’ in its totality is a very listen-able album, and perhaps a cd I could give as a gift to a non-jazz listener. But I hope Roy Hargrove’s next album will rise up to the standards that both him and I have set. Watch Roy Hargrove perform one of the songs from ‘Earfood’ below!